So, now that it’s after Christmas, I know some of you are wondering what to do with that left over ham, right? Well, I’m with you on that and have always wanted to try using the excess meat and ham bone in a recipe. So today in the Bake Shoppe we put or frozen, leftover ingredients to work and made some Ham Bone Pea Soup! Wow! Not only did this taste heavenly, it lasted 3 nights between 2 people! Preparation is simple and this is a great meal that will cook itself! I had a little help from various online sites about how to make this in a crock pot and what ingredients to include besides the ham and peas obviously, hahahah! Layer ingredients in slow cooker in the order given; pour in broth. Do not stir ingredients. Cover and cook on HIGH 4 to 5 hours or on low 8 to 10 hours until peas are very soft and ham falls off bone. ( I recommend the 8-10 hours, “low and slow.”) Remove bones and bay leaf. *next step is optional* Place all ingredients in a blender and blend really well to thicken to thicken more, if desired. Add the liquid broth slowly to the blender as it blends. You may or may not need all the broth it produces. This also freezes well. Set the oven temp to 400. 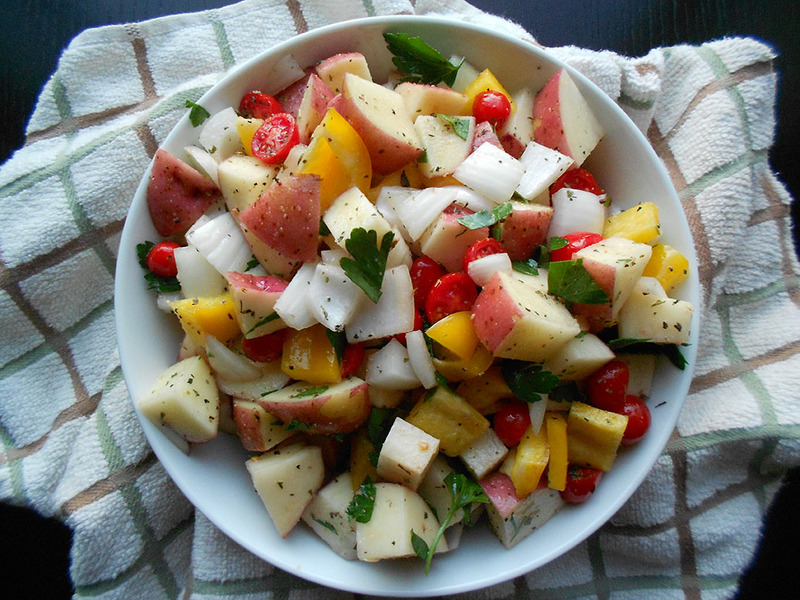 Wash produce and chop up potatoes, onion, bell pepper, tomatoes and parsley. Next add all the veggies to a large mixing bowl and include the garlic cloves. Add about 2-3 Tbls of olive oil and then sprinkle the mix with all spices EXCEPT the salt. Salt draws out moisture so you don’t want to add it before cooking otherwise the veggies may shrivel up. So reserve the salt for after the potatoes are done cooking. Now, lightly hand mix the veggies turning a couple times over to make sure they’re well coated. In a large glass baking dish use a little cooking spray to coat the bottom, then transfer the veggies. Place in the oven uncovered and roast for about 45-50 mins. 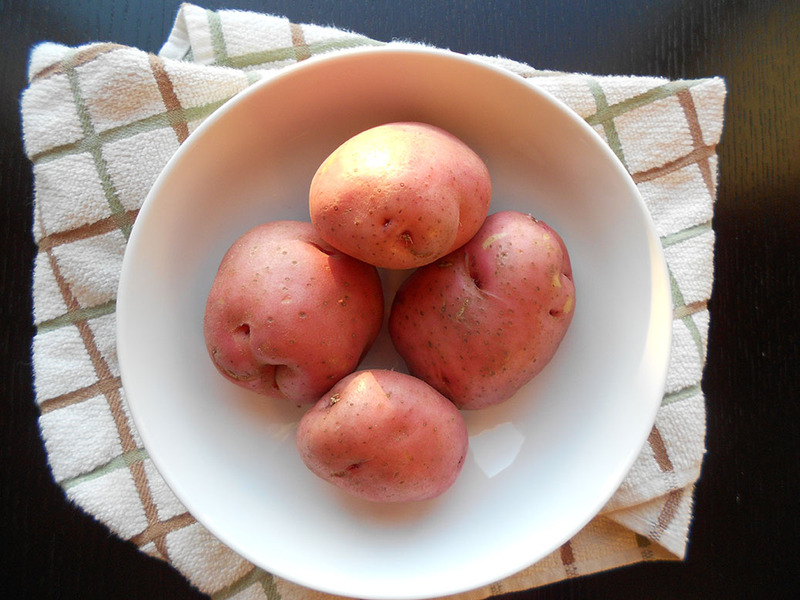 Once the cooking time is up , pierce the potatoes to make sure they’re done! 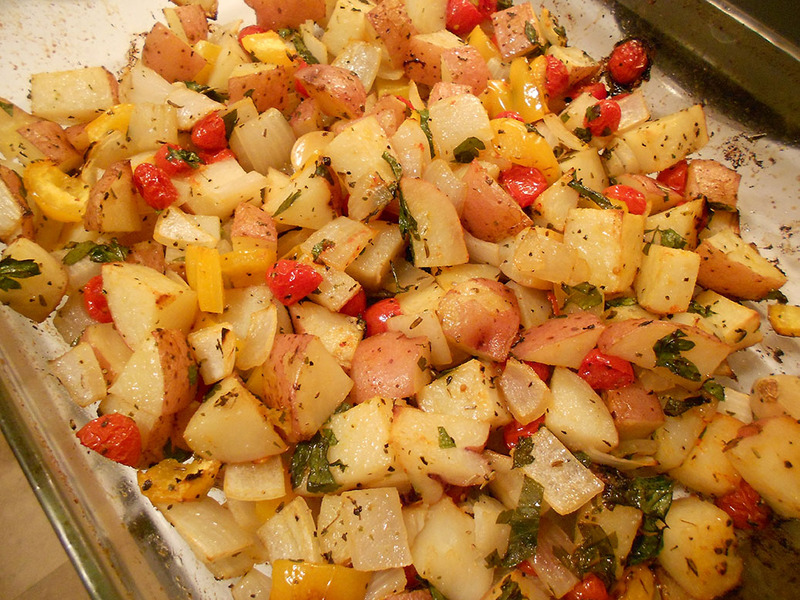 After removing veggies from the oven, you can now add some kosher salt to taste! *Note* If you’re a garlic lover…ADD MORE GARLIC!